← Mail Sack: Builder Questions, #1 RV-9? Here is the second of a new series, where I take actual letters from builders and answer the questions here, where the answers can serve many builders. Because the writers sent in the questions as private email, I have trimmed their name off the email to respect their privacy. Their questions are in blue, I put the answer in black. You can click on the colored links in the answers to read stories with longer explanations. bring? Is a core needed or can I buy it from you? There have been thousands of hours flown on Corvairs with Aerocarbs, the red flat side predecessor to the Aeroinjector. There are reasons why they have their fans, but It is not a carb I would choose for a Corvair, and I would never run one in a fuel system with a pump. I know it can be done, but that doesn’t mean I would choose to. 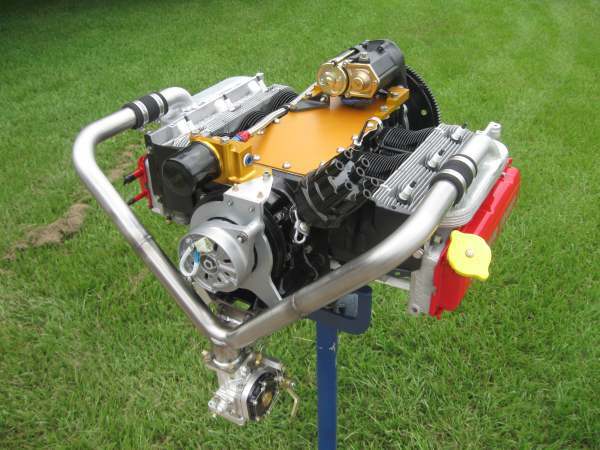 To learn more about carbs look at: Carburetor Reference page. Dan’s panther runs an MA3-SPA and he performs a lot of aerobatics with it. If you wanted to move up one level, look at a Rotec carb or an Ellison EFS-3A. The Ellison is now out of production. (After 30 years and thousands of carbs, Ben Elison perhaps has gotten a little tired of homebuilders who don’t read instruction and ‘experts’ on his products who have never used one) You have to speak with Dan, but his original plan was to use a precision mechanical injector for advanced work. see a picture below and read more at this link:Mechanical Fuel Injection Testing. lot of creditability to using a Corvair engine. Thank you. I remind people if you do something for 25 years, you have a good opportunity to become very good at it, especially if the job involves teaching it to other people. I have seen a 233, and it is impressive. It is not as light as the promoters suggest, but that is true of most engines and airframes in experimental aviation. ( A standard 10% error is what I call CBW- calibrated brochure weight, which is the actual weight multiplied by .9 for marketing purposes) You are correct, Lycoming, and continental in particular, don’t go out of their way to serve homebuilders. They certainly are not going to hold a free ‘Continental College’ any time soon. feel comfortable. UL, short TBO and too expensive. How about Continental? less power and high cost. Then there is the Jabiru 3300. A real possibility. Better cost than a Continental, but is it as reliable? I don’t know. There are a lot of choices, and you sound like you have looked at most of them. Your previous flight and aircraft ownership background is actually serving to inform and fine tune your choices. Builders just getting started with little or no personal reference have a hard time navigating this selection because magazines and other pilots don’t offer much valid input. Reading our site gives a good look at our perspectives and philosophy, which I hold to be more important that exact weight or cost. very well when I have confidence in my sources. You sound like our kind of guy. Because I teach this stuff instead of just selling a product in a box, I am particularly good at directions. I find it very funny that if you look at any modern product in a store, the guy who wrote the directions inside was obviously the low man on the totem pole. Every other person involved, marketing, packaging, legal, etc, got more of the budget to work with. Businesses try that in experimental aviation all the time, and it never works. Shiny wrapping paper often = Empty box. tells me that fuel starvation during basic aerobatics is not a serious problem. I don’t think that I will know for sure until I try. If you see the plane fly in person, you will be even more impressed than watching it on film. It captures the eye and holds it. The level of flight Dan gets from a standard fuel system is hardly to be believed. A simple change to a Rotec or Ellison and a flop tube would go even further. is still fluid. The idea of building an engine in September is very attractive. return home with a working engine for my Panther. Above, a rear view of the engine. Behind the harmonic balancer is an alternator driven off the crank through a flexible coupler. It is a project that Dan and I worked on, that he now sells as a rear alternator kit, P/N 2950. It retains the balancer and cannot put bending loads on the crank. I have never been a fan of belts on the back of the engine, but this system does not use one. The alternator is the same Yanmar unit we traditional use on the front of the engine. The intake is a custom stainless part made in our fixture so that it mates with our traditional welded on head pipes. On the bottom of the intake is the Precision mechanical fuel injection unit. Dan has designed the Panther to have tremendous airframe strength. The test wing took more than 9Gs at gross weight in a sandbag test conducted after Sun N Fun. Although Dan designed the plane to be easy to fly, it is capable of impressive aerobatics. Classic & right on the money (pun intended)! LOL!! !